Part 1 : Exploratory Committee. I’m going to go with something a little different today. Less homey & antiquey and I’m just going to go into art mode here. 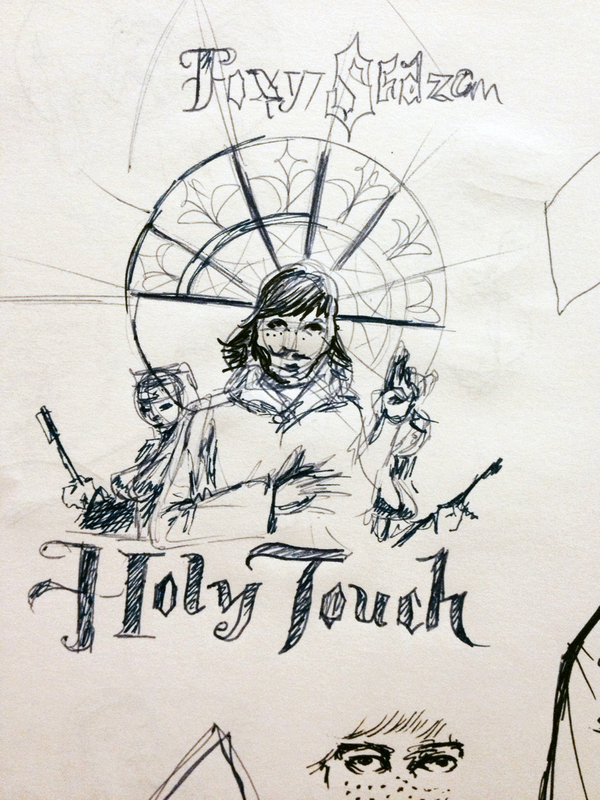 I’m a huge fan of the band Foxy Shazam and was completely excited to hear that they were hosting a contest through Creative Allies to design their next shirt promoting their new single “Holy Touch“. I got right on it. Typically I don’t enter these contests…but…being a huge fan and being a designer, I had to win this. One of the luxuries of taking public transportation to work everyday is I could make it a productive. As busy as things are, it really is a genuine privilege to just literally have to sit down and be still for an hour a day. I used this time for my pre-production which is one of my favorite parts of the design process. To me, I’ve found this to be THE most important step for me in creating. To me, good ideas aren’t just low hanging fruit. If I went with one of the first things I thought of, that’s likely the I really want to work and wrestle with as many different ideas in as many different directions as I can and then narrow it down. I’ll go through dozens and dozens if not hundreds of very rough scribbles & sketches to get passed all of the cliche’ ideas and get to the ideas that are underneath those. It also helped that I was already acquainted with the band’s catalog beforehand so I could draw on looks & themes that they’ve already approved. Every album, photo & video that the band puts out is a little visual clue as to what they like and the music, of course, is a HUGE indicator of any look or feel. 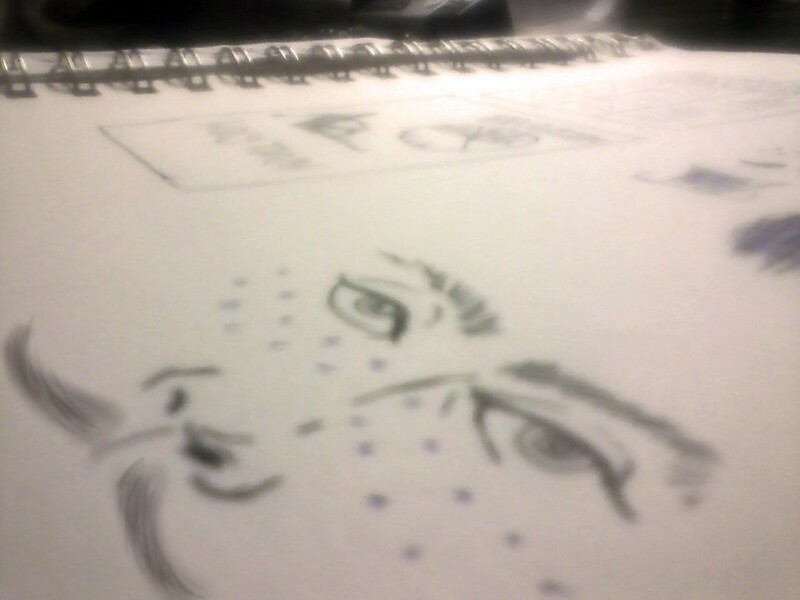 Honing in on the design. The iconic broken window makes an appearance early on in the sketches. Eric looks heavenward with rock’n’rosary in hand. I went through a long process of working things out on pen and paper before I even started on a computer. I had to get through “easy” ideas that I figured a lot of people would think of in order to get to more meaty ideas that were behind them. The shirt’s purpose is to promote Foxy Shazam’s newest single/video called “Holy Touch”. Mind you the video didn’t come out until a week before the contest ended so none of the designers had a clue where the band was intending take the “Holy Touch” concept themselves. 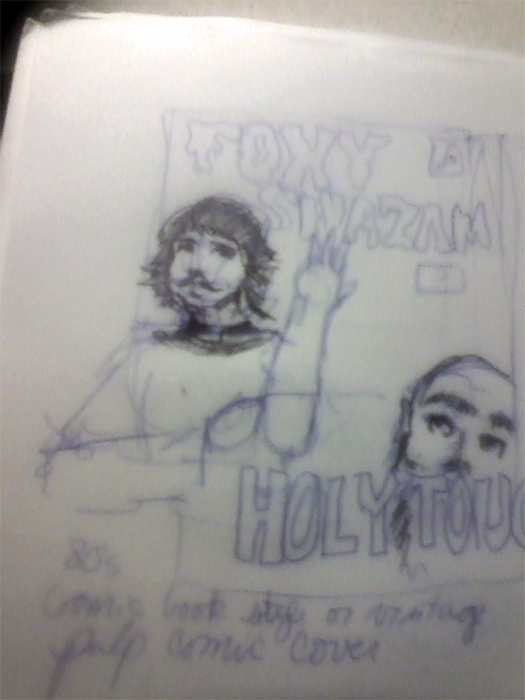 Without any direction, I had to consider how I would represent Foxy Shazam representing “Holy Touch”. Because they were the first things I thought of I figured crosses, rosaries, & Michelangelo’s ‘The Creation of Adam” would show up often in people’s designs. It’s not that these elements are no good – I did several designs using these very elements in fact – but I had to thoroughly explore the idea before I could entertain the thought of returning to those first ideas. My experience has also taught me that more often than not my strongest ideas come at the end when I’ve already felt I’ve long exhausted all my options. I make it a practice to keep pushing myself to explore & create even after I literally hit a wall and can’t come up with any new directions to take it. I was planning on going with one solid design that I’d hang my hat on but if I had any other ideas along the way I’d throw them into the pool as well. The whole motif of the album as a whole was this idea that there’s a “Church of Rock’n’Roll” and this building in the video is said to be it. 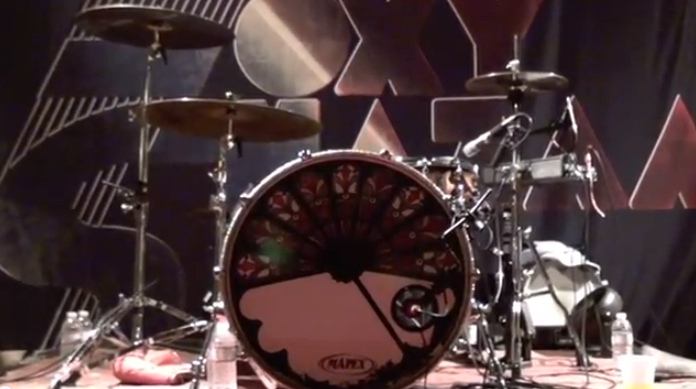 Having seen the band live several times I also noticed that the drummer Aaron McVeigh has a graphic of this very window on his bass drum head. That’s the biggest bass drum I’ve ever seen…and I like it. Taking this project seriously and truly treating Foxy Shazam as a client, and not having the luxury of talking with them, I of course should make careful note of what they like & how they’ve represented themselves in the past and the fact that they’ve used this image several times tells me that something about it speaks to them and has resonated with them and if I do something using this window, it will hopefully resonate with them as well. So it was settled. I would go about recreating this window. How I would use it, I didn’t know – but I knew that I wanted it to be featured in the design somehow. In addition to seeing Foxy Shazam as a client, I also realized that it was a competition and taking the time to recreate this exact window wouldn’t be a simple task and other designers might not take on so I went ahead with it. A few minutes of internet sleuthing and I figured out that the church in the music video was 150+ year old First German Reformed Church in the band’s hometown of Cincinnati, Ohio. I also learned that the band’s keyboard player Sky White also is a co-owner of the church as well so I definitely knew that this place was near and dear to some hearts in the band so I was very confident that I was going the right direction by using it. In researching the church I also recreated some of the less iconic side windows in the church that don’t really appear in the video. I didn’t end up using those in the final design but my intent was to, if I used them, let the ‘client’ know that I did my homework and came into this project more than prepared. One of dozens of sketches: The stained-glass window gets prime real-estate here but the idea ( Nuns with guns behind Rev. Eric Nally) is too much of a derivative of their ‘I Like It” video. Keep on keepin’ on. 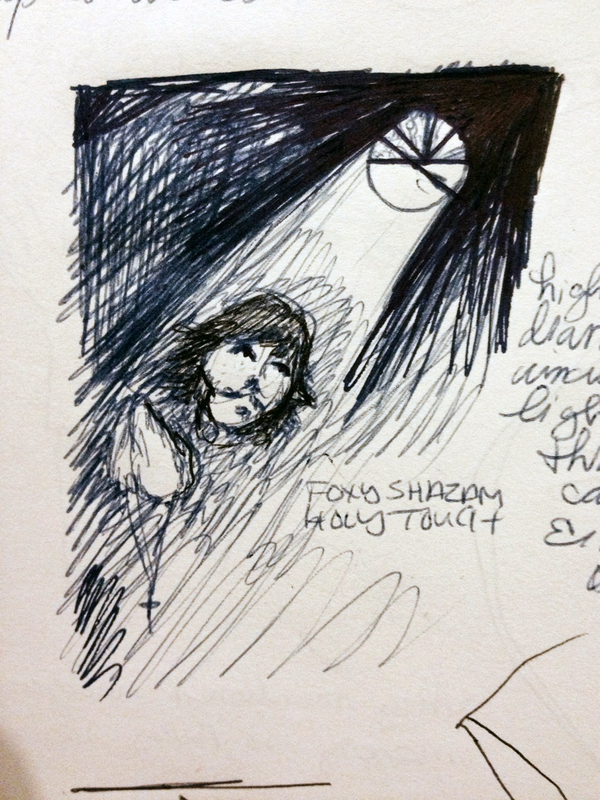 Though Foxy Shazam’s music is hard to pigeonhole, there’s definitely something nostalgic about it. The glamour, the excess, & the tongue-in-cheek rock spectacle is fresh but familiar . When singer Eric Nally describes his musical influences he usually doesn’t list musicians but rather thoughts, feelings, smells or experiences, oftentimes associated with childhood. So that got me thinking of what I personally find nostalgic and familiar. Comic books. I started out with a more the idea to do 1950’s pulp horror comic meets Rocky Horror Picture show (an idea I would’ve come nowhere near had I stopped at my first few ideas for sure). Singer Eric Nally with a bloody rubber glove & doctor’s scrubs falling revealing a priest’s collar underneath & people/the band running in terror? Drippy, spooky lettering? I liked the idea but I felt it didn’t really have it’s finger on the band’s pulse. It was almost there but not quite. As I mentioned I really wanted to take my cues from what I knew of the band at that point but also, in the spirit of the music itself, take some chances. So there’s a line that I had to walk without the benefit of being able to ‘check in’ with the band to make sure I was on point with them. I felt the horror pulp comic was the smallest bit off target but I loved where it was going. I decided to bring it around towards the highly entertaining, oftentimes goofy comics of the 1970’s & 80’s because I think that really ‘landed’ with what the band is like…vintage flavored, dramatic, and a whole ….lot…. of…. fun. 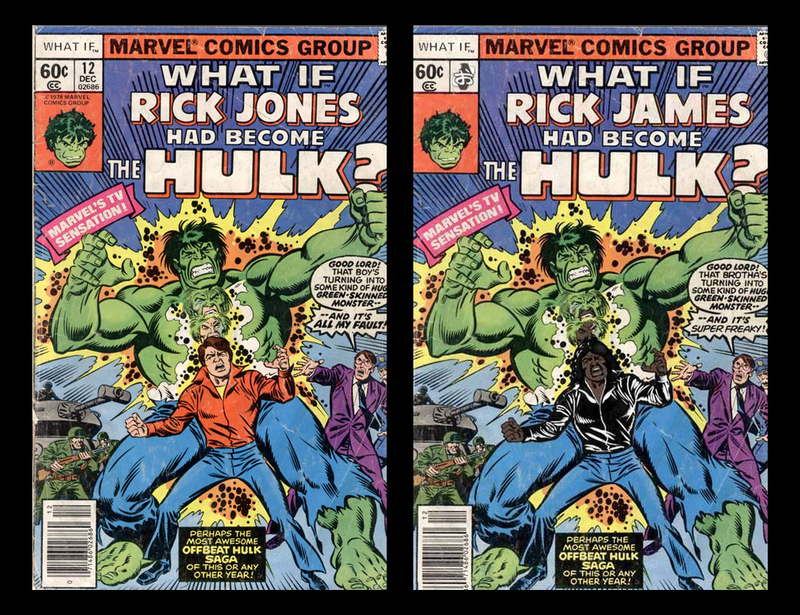 While I was playing around with this idea, thinking of music and comics, what came to mind was a very convincing comic spoof I’d seen of Rick James being drawn into an old Incredible Hulk cover. It was perfect ‘vibe’ and I felt like it hit the nail on the head and was exactly the tone I wanted for my design. They hadn’t represented themselves with comic books before or even mentioned them but putting them together, I felt like the guy who first put peanut butter & chocolate together must’ve felt. That was the ‘taking a chance’ part of the exploration. This was the direction that I was going to head. I could’ve done the shotgun approach and just made as many designs as I could, submit them all, and pray that one hit the target. I did entertain this thought briefly but I felt that was not the wisest way to go about things. Since I had the time to think about this I was going to approach it as thoughtfully as possible. In the end, I think the shotgun approach wouldn’t have really sharpened my craft or enhanced my tools in any way. It might’ve shown that I was fast and able to think of many good ideas, I find more value in not only going the distance and investing developing a great idea and but also committing to that idea. anything when combining 80’s icons & comic books. It was an idea but I never claimed it was a good. As you can tell it was a simple design that didn’t take more than a few minutes to create but it wasn’t the least bit smart or clever and though it might stand out a little amongst the plethora of riffs on Michelangelo’s ‘The Creation of Adam“, it was by no means on the cusp of ‘why-didn’t-I-think-of-that” territory, which is where I think great ideas should reside. Simple & smart takes the cake in my book. This was simple but not necessarily smart. You’ll only see it when it’s really really time to do laundry. 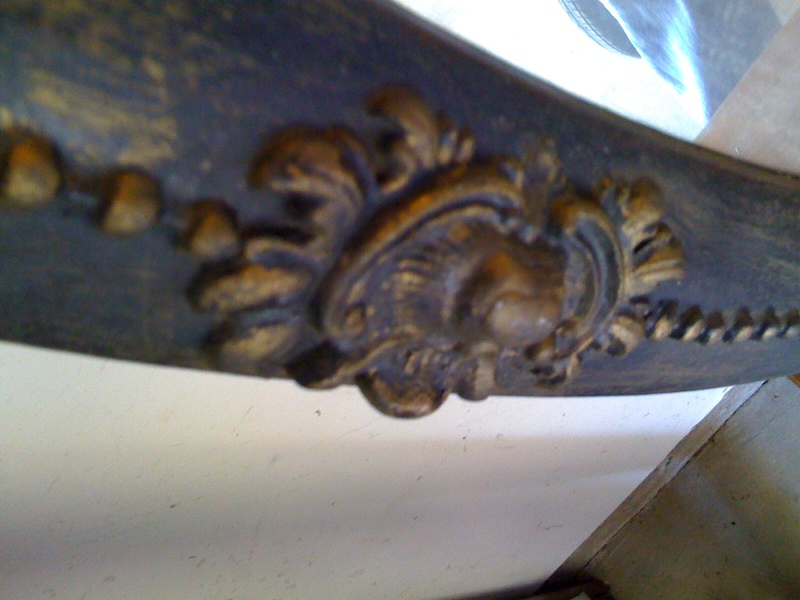 A while ago, I came across a treasure trove of 1920’s-30’s era furniture that was just sitting outside a nearby neighbor’s house, waiting to be thrown away. This little dresser drawer was among those items. I decided that I wanted a put some drawer linings inside of them and I really wanted have fun with those. Now I know that not a single guest would likely every see these (and neither would I really) which makes it the equivalent of ironing your socks & underwear but oh well. You can take a piece of foam core (or you could use cardboard but we wary of the corrugation as it might cause ripples) and cut it to the exact size of the bottom of your drawer. From there, using scrapbook paper, vintage wallpaper, computer printouts and whatever other ephemera you can find, you can let your artistic & collage-making sensibilities go wild and really create whatever you want here. I love checkerboard patterns & Victorian etchings so that’s what I did here. I found 4 different kinds of scrapbook papers that I liked (two darkish, two lightish) and made the checkerboard, adhering it using Modge Podge. 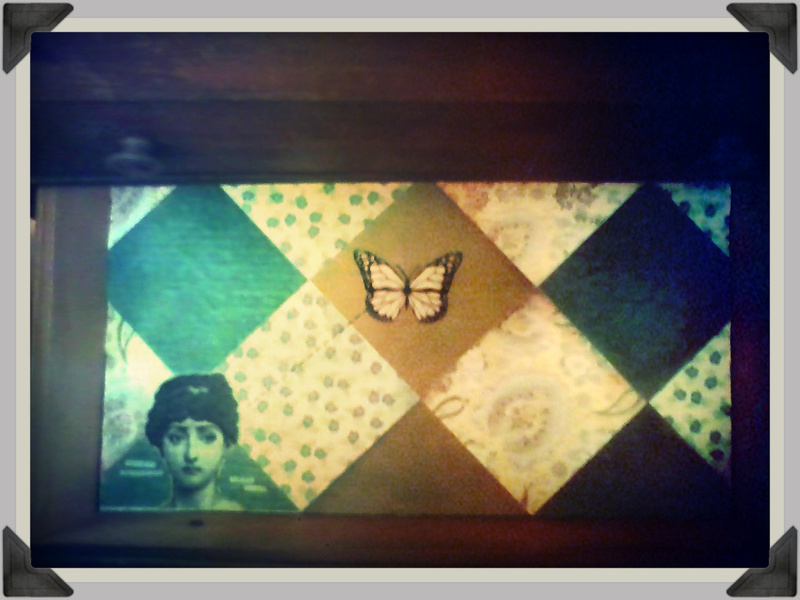 Then I found an image of a Victorian woman & a butterfly on the internet, printed those out and put them over the checker board. I also printed out a very small poem by Margaret Atwood and put that in there as well for fun and then Modge Podged over the whole thing. A good resource for vintage ephemera and photographs & graphics to print out and use is The Graphics Fairy. So that’s just ONE of the 5 or 6 drawers. Each one can be different, the same, themed, or-whatever. I’m going to make each one different but all with a Victorian whimsy flavor to them to tie them all together. If you try this, do send pictures as I’d love to see what you come up with! PS ~ I don’t scrapbook but scrapbook paper is incredibly wonderful to have around. I have books and books of it and have used it countless times in so many projects, including this one. Whenever you see that a book of it is onsale, get it! Don’t waste money on individual sheets as you get a much better deal on the books. First of all, this is part III which obviously relate to part II and part I. If you’ve just stumbled onto this blog, it might interest you to check those out as well. Second of all, there will be a part IV to this. Though the armoire is standing and functional, there still is a bit to do yet aesthetic-wise. And also, this is not really a how-to so much as it is a this-is-what-I-did. I know that some people find this site via a Google search seeking how that might go about repurposing an old piano they may have. If you have any specific questions regarding how I did something, send me a note. I’m working backwards here by showing the most finished picture before showing the ramp up to it. But I got excited. Can you blame me? Doesn’t this look fun? I’m so pleased that it turned out as well as it did. Vision is one thing but execution is everything. But I am getting ahead of myself. So you saw where it was last time; a hollow shell. Well there isn’t that much more to than that really. Here's a look at her shelf guts before we sow her back up. A hole right in the center. Now without too much difficulty at all, I can again change channels just like a modern man. The only drawback is I can’t be too far left or right of the hole to use the remote. If our particular TV had a plug in sensor like some do, we’d be in the pink. That would’ve been very helpful. I will paint or stain the inside of the hole so it disappears somewhat ~ or perhaps cover it with an antique radio speaker cloth (like this) which would hide it yet would allow whatever necessary magic remote control rays to arrive to television. It may be a moot point as the hole basically disappears when the cover is up (see the first picture in this post). As I mentioned, there will be a part IV to this as there’s still work I’d like to do to it. I want the television to be able to be 100% concealed whenever I want it to be so I will have to figure out how to put hinges back onto the music stand that is currently missing. Initially I was going to have it flip straight up but there are several reasons why that won’t work. Plan B is to split the piece down the center. Ideally I’d love to be able to have them close like this player piano‘s does but I think the shape of my piano simply prevents that from working. What I’ll likely end up doing, if the moulding on the edges permits, is turn the single music stand into 2 cabinet-esque doors I can open and close. It’s been mentioned a few times by a few folks that I should do this as a business. That’s an interesting thought. This project was one of the biggest pains in the neck ever but in the end it worked. 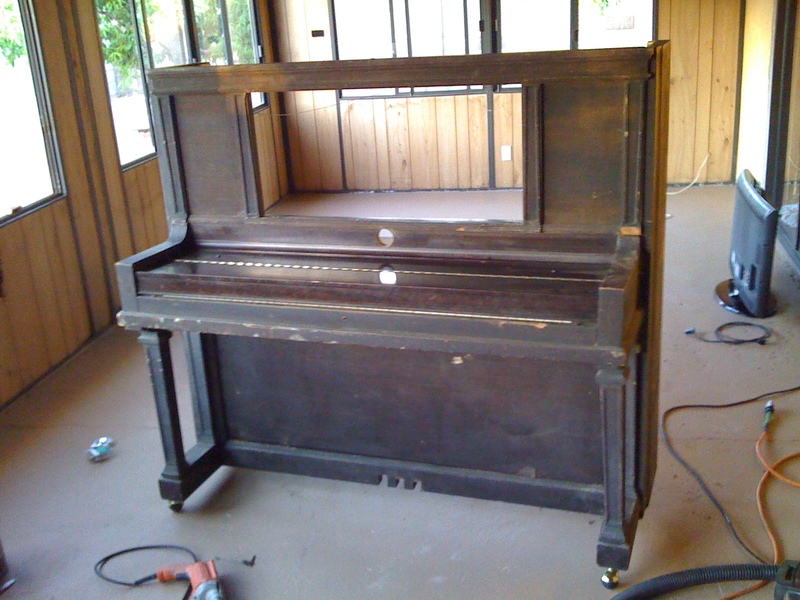 If you’ve got an old piano that you don’t play and you’d like to do something like this (or something else altogether), do drop me a note. You’ll find I can be quite awesome, but humble. It must be said that I couldn’t have completed this project without the help of Kevin Garcia, whom I referenced in one of my very first Hair Tonic & Horse Feathers posts, as well as Mark Rosellini. Even more thanks goes to my wife for allowing this project to go on INDOORS for so long. Hopefully a nice piece of unique antique furniture to hide our ugly black & shiny modern devices will make up for the trouble . The song, “Boll Weevil” is a song that I’ve been obsessed for many years. It’s essentially a Moby-esque ‘folktronica‘ mashup done by the late Greg Hale Jones using the vocals, recorded 72 years ago, of early 20th century folk vocalist Vera Hall singing (acapella) the song “Boll Weevil Hollar” to which he added his own instrumentation. The film itself is a brilliant concept which I cannot help but to compare to a scene in one of my favorite movies of all time, ‘O Brother, Where Art Tho?’. It also reminds me of an absolutely fascinating true story about a town that used to be called Jocassee Valley but is now a lake called Lake Jocassee and the hotel that still sits 300 feet beneath it. Ever since I heard about Jocassee, I can’t stop thinking of it. I’ve written songs about it. Very haunting, very magical, very…tragic. But I digress. It’s a brilliant song and a clever video that Mr. Nick Zynda has made for it. I absolutely applaud his smart amalgamation of modern technology (green screen & underwater footage) and old-fashioned themes and classic film making techniques (by using miniatures). Hopefully this short film, Greg Hale Jones’ song & the story of Jocassee Valley will inspire you as it did me. It’s been a while since my wife and I have been able to get out and do some good old-fashioned hunting and gathering of trinkets and treasures. Between Craigslist and a massive garage sale we came across this morning, we found some great gems this week. Pay no attention to the man behind the hair tonic & horse feathers. The aformentioned garage sale was the biggest one I’ve ever seen. Blocks and blocks of folks out on their lawns in the early morning, hawking their wares, pawning their junk into our garages instead of theirs. My wife and I have a thing for oval mirrors & frames and this one caught our eye right off. We showed interested in this well-loved thing and the owner says, “Do you like it? Take it”. Sounded happy to get rid of it. Fantastic. We’d just been there 10 minutes and we were already given a free antique frame. 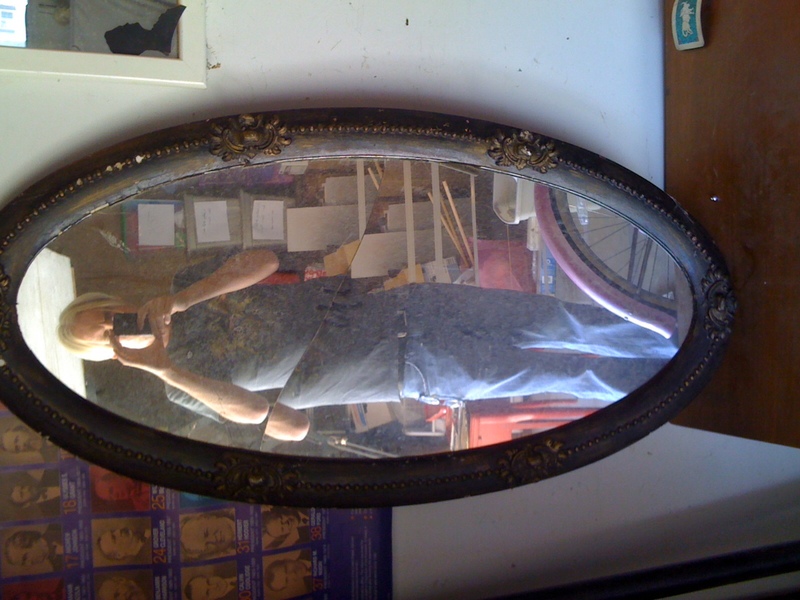 It needs a fair amount of tender loving care and a new mirror, but stay tuned and I’ll post a picture of it up in my house, looking like a million bucks. 8 arms & 16 Candles. Sounds like HP Lovecraft's take on an 1980's coming-of-age film. My wife gets all the credit for this one. She’s been a noiseless patient spider looking for just the right chandelier for quite a while. The ones that we’ve liked at antique shops have been perfect but just too far out of our budget so she’s been scouring Craigslist for just the right combination of looks & price. 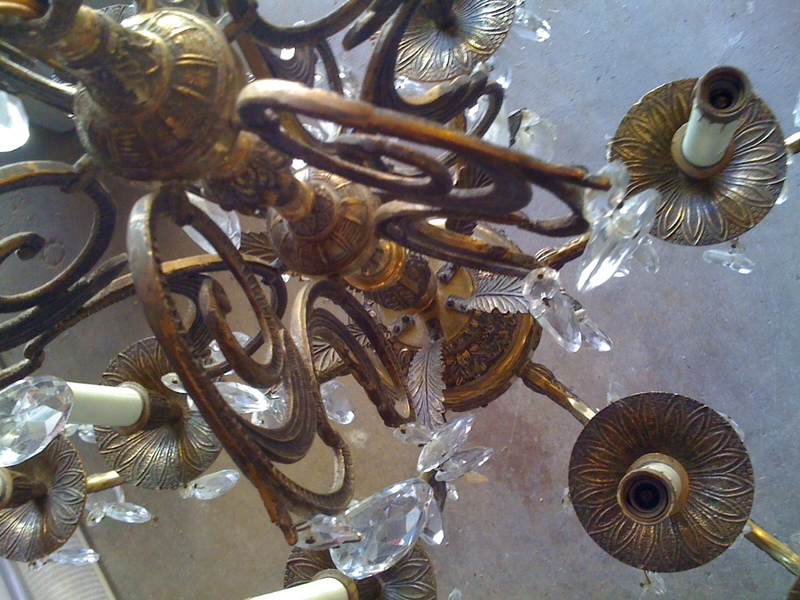 She found this gorgeous pre-war era chandelier in (hoity-toity) Beverly Hills for the wonderful price of….one hundred dollars. It might’ve been the very last thing in Beverly Hills that cost $100. 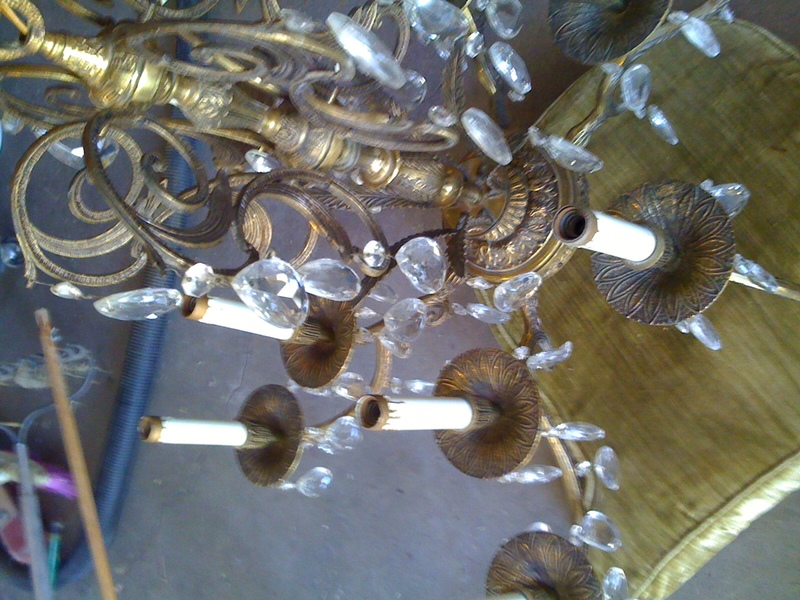 It’s usually more than we’ll pay for an antique but we’ve seen other $imilar chandelier$ go for beaucoup buck$ el$ewhere. We got it for a song. A short song at that. WELL DONE MRS. HAIR TONIC & HORSEFEATHERS! A phrase from a high school Spanish textbook that will finally apply: Hay dos tablas rojas. 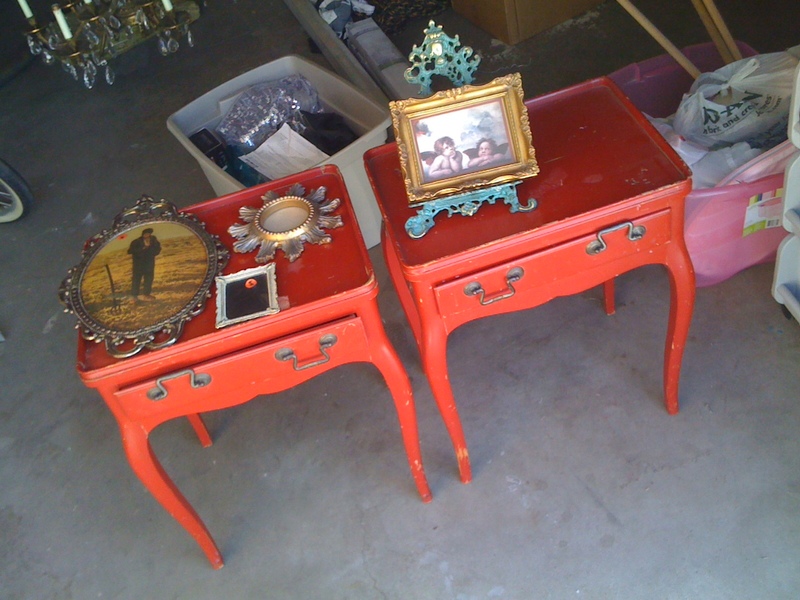 These two little red tables caught our eye as we were driving past them on the street. The owner originally wanted $30 for both but my consummate bargainer wife got them into our car for $20 instead. We love these tables but we’re thinking that we might be able to make our money back and then some if I fix them up and sell them. Crafty, antiquey people these days love red furniture. Red furniture is the ying to shabby-chic-white’s yang. So we shall see. In any case they’re in great shape and the attention they need is very minimal. I’ll keep you posted as to where these end up. P.S. : Do you like the little knick-knacky frames we got as well? Tengo tres sillas. Spanish 101 strikes again! 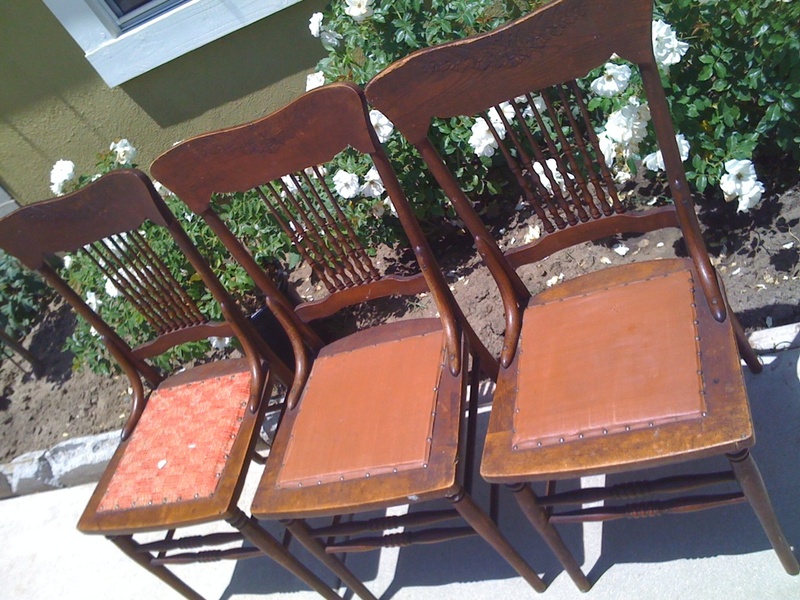 Again, at this morning’s epic yardsale extravaganza, we picked up these 3 chairs, which by the seller’s estimation, probably from the teens or twenties. The asking price was $10 each but my wife, as per usual, convinced them to let us take them for half of that. I’ve had success in the past with light-repairing and reupholstering my own antique furniture so I’m going to try my hand at these three. Again, like the tables, we’re thinking of selling these once I fix them up and recoup the money we spent on the chandelier. We’ll see though…I’m going to do them and hopefully I won’t fall in love with the finished product too much to sell it. Any good yardsale finds for you lately? Any discards that you’ve rescue from the curb of death? Let me know! Let us see! It’s been a while since I’ve posted but that’s not stopped my regular influx of people who come to this site to find one of two things: information about vintage ice boxes and/or 1930’s european haircuts. If you want to make a website with guaranteed traffic, make one about those things. 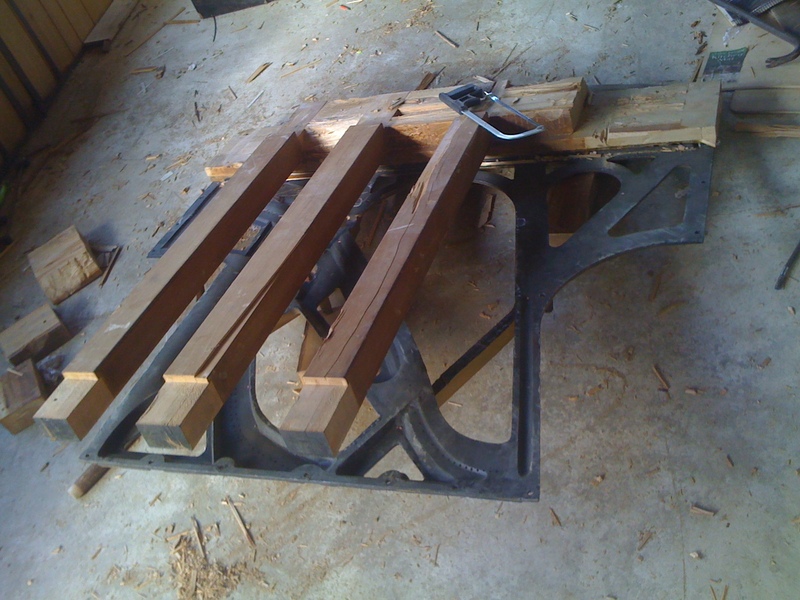 So I’m returning to post a little bit of the progress for my piano repurposing that I wrote about here a few months ago. I’ve got a hard deadline of July 30th to finish this up and get it home-ready so I’m burning the 9:30 oil to get it done. I’m too old and what with work in the morning, to burn the midnight oil. I’m still aiming to make it an armoire for our flat-screen Netflix machine (our television) and though the hardest parts are finished, I’m left with the parts that required a little bit of know-how and that’s a lot of what I don’t have when it comes to construction. 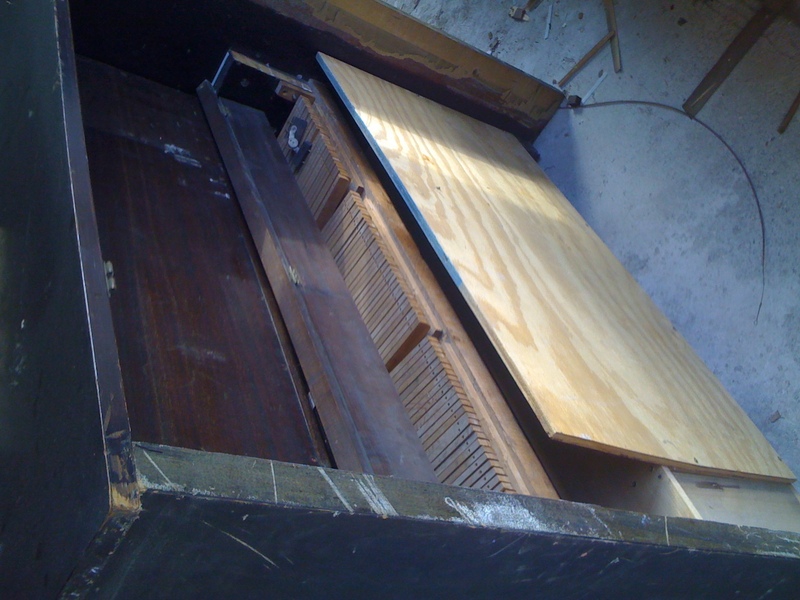 As you might be able to figure out from the photo above (and the photos in part I ), I was able to get the harp of the piano out and sort of reconstruct the shell of the piano. You can see it there at the bottom of that picture. THE hardest part of all of this has been trying to remove the harp from the wood it’s connected to. The 88 tuning pegs that held those high tension strings are no surprisingly anchored into the wood. It’s like they didn’t want them to move. Ever. I’ve tried removing them one by one as if they were a bolt but aside from not having the right tools, those things do not want to budge. Plan B. Even that has been too insanely heavy to move by myself. Since I’ve been doing this all by myself I’ve not had any help thus far, it’s just been laying on the floor where it landed for a few months until I’ve been able to get to it. To get some of the wood off of it and make it light enough to at least scoot I’ve had to literally beat it with a sledgehammer and a dull axe that’s about as old as the piano. I am beating only the wood (if I can help it) and am trying to salvage the harp so I can repurpose that too once I’m finished with this project. With the help of a friend I’ve actually made the piano about 3 or 4 inches shallower (though it had gotten too dark at the time for me to take pictures of it’s post-op state). Our home & living room is small enough to be measured in square inches rather than square feet so space is definitely an issue. As a remedy, Jen & Pat, two the lovely ladies at Aubergine Emporium suggested that we cut the piano to save a few inches. 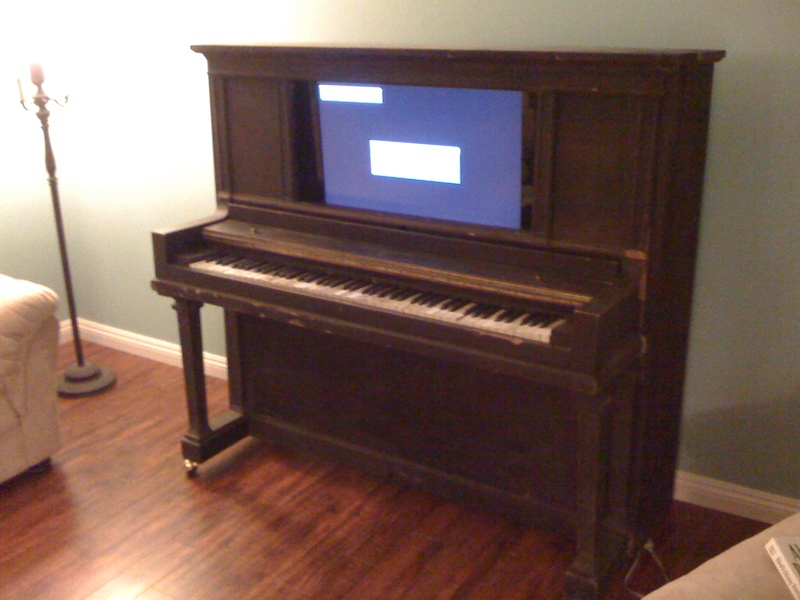 It was a brilliant idea as the television was a flat screen, we didn’t need all of that room inside the piano. As an added bonus, it’s just that much lighter too – and it needed the diet. Even though all the really heavy parts are out of the piano, it’s still a beast to move. So that is where we are at the moment. 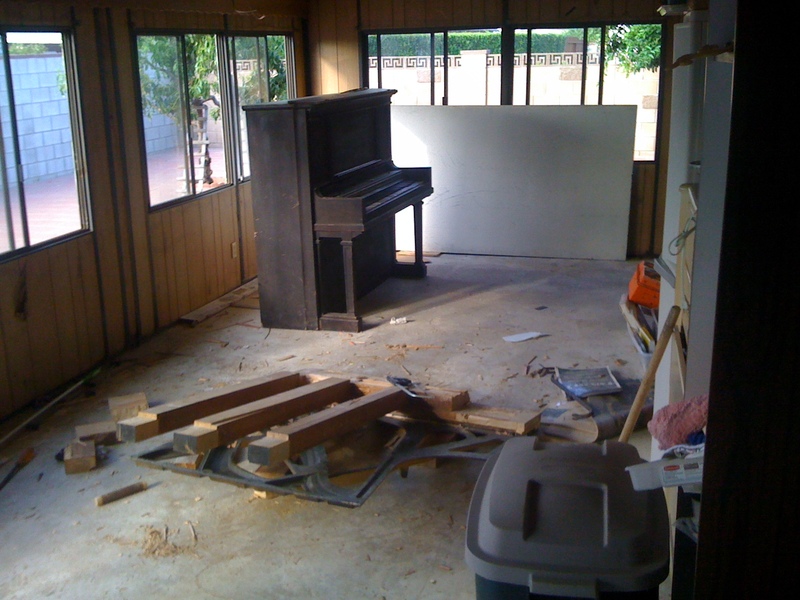 The shell of an upright piano with a slimmer figure and it’s organs have almost all been harvested. 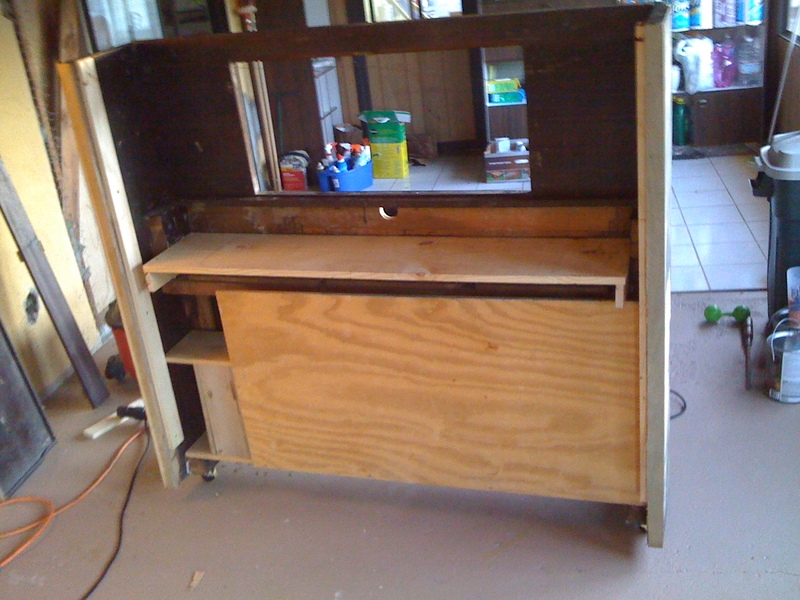 The next step is to build a shelf sturdy enough for the television and strengthen the whole structure a bit from the back. Without all the inside supports, it kind of does a hula-dance if you push against it. Not something I’d like to set an expensive piece (yet ugly) of technology on quite yet. Part III and hopefully a finished product coming very soon. Oh yeah, and wheels. A nice set of new casters are in order. There’s been a lag in posts as of late and here’s why: I’ve been helping Mrs. Hair Tonic & Horse Feathers get her dissertation ready and have been helping her prep for her oral defense. And it’s all paid off because Mrs. Hair Tonic & Horse Feathers is now Dr. Hair Tonic & Horse Feathers. A million hugs and congratulations to my wife: my truest treasure in this world. She’s inspiring in every way and I hope she can share her story to you all soon. It’s an awe-inspiring one.